In a rush to get through all the episodes of Luke Cage? Way behind your partner on seasons of House of Cards? You can get through your Netflix queue faster than normal and save yourself some time, as long as you're prepared to do a little bit of under-the-hood tinkering in your browser. As pointed out by the smart folks at Efficiency Is Everything, you can download a video speed controller such as the aptly named Video Speed Controller and then have your movies and shows go by just a touch more quickly. At a 1.1x speed, you're saving yourself about six minutes for every hour of binge watching. 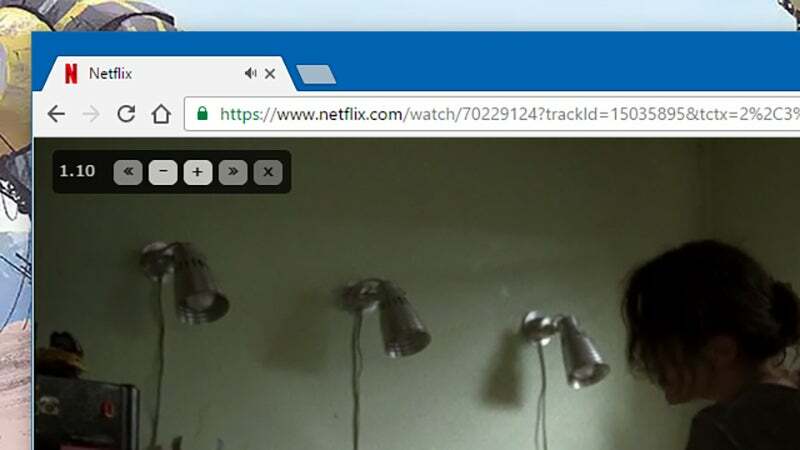 Video Speed Controller needs the Netflix HTML5 player to work which should be the default one used on modern systems with the latest versions of Chrome. Once Video Speed Controller is installed, you're all set. Open up Netflix, pick your show of choice, and then hit the D key to increase the playback speed (or hover the mouse over the playback speed indicator in the top left corner). In the case of some Michael Bay flicks, you might not even notice the difference, and you can use all the time you've saved to go outside and do something away from the couch.